Team ViGIR's Atlas robot uses a drill. Miami is hosting a clash of metal titans this weekend, and 17 robots from around the world have gathered to to take part. 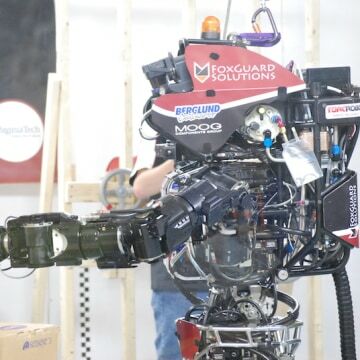 As part of a competition to find and crown the best rescue robot, the machines will play hero, slicing through walls, climbing ladders and carrying firehoses, vying for $2 million in prize money. Future versions of these bots, it is hoped, will be used in disaster response, to be sent to zones when it is dangerous for humans to venture out. At the Fukushima nuclear power plant following the 2011 Tohuku earthquake, a human response squad reached their radiation exposure limits before they reached and released a crucial valve — so they had to turn back. A robot could have completed the task, DARPA, who is funding the Robotics Challenge Trials explains, and that incident inspired this set of trials. Ten teams in the competition built their iron men from scratch. 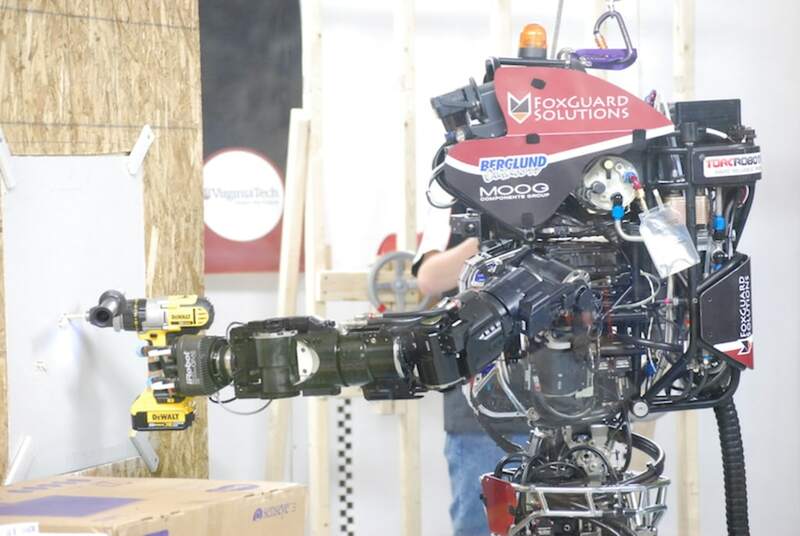 The rest scored high in previous challenges and won a standard-issue humanoid to program and retrofit: versions of Atlas, built by Boston Dynamics (now owned by Google) and funded by DARPA. Game-ready robots were packed, crated and shipped by container truck from Pittsburgh, Boston, Philadelphia, and arrived at the Homestead-Miami Speedway earlier this week, in time for the games to kick off Friday morning. The robots will be scored for strength, dexterity, mobility and early signs of independence. The machines are semi-autonomous, which means the teams still control some aspects of their movement. The eventual goal is for the robots to carry out mechanical tasks autonomously, drawing from prior programming. Each team will have thirty minutes for each task. Among those, the robots will drive to the test location, exit their vehicle and walk over uneven ground. They’ll remove debris from doorways, climb a ladder, carry and connect a fire house, and seek out and shut leaky valves. Eight teams will ultimately qualify for the finals taking place next year. Jesse Hurdus, an engineer at TORC Robotics and a member of Team VIGIR expects that the ladder climber will be a tough one. For NASA JPL’s RoboSimian, a four-limbed robot with interchangeable arms and legs, it could be the wall task. “It requires both the force to cut through the wall as well as the dexterity to make the cuts along a straight line,” Brett Kennedy, supervisor of the Robotic Vehicles and Manipulators Group and leader of Team RoboSimian wrote to NBC News. “Expect to see some very slow moving robots,” Nicolaus Radford of Team Valkyrie from NASA’s Johnson Space Center, told NBC News. “We know the robots are slow and unsteady at this point — they’re much like a one-year-old human in terms of locomotion and grasping abilities and much farther behind that in brainpower,” said Gill Pratt, DARPA program manager said in a release. But by next year, these "baby steps" will be refined. Expect more complicated tasks and “realistic disaster scenarios” when the qualifying teams return in one year for the final round. "I think the improvements that you’re gonna see in the robots next year are going to be very extensive," Radford said. The competing engineers expect that real-life rescue systems and robots could be as close as 3-5 years away. “The much larger question is how quickly such systems would be accepted into the user community,” NASA-JPL’s Kennedy said.